In 2011, Walnut Hill Group acquired the Tuscan Inn at Fisherman’s Wharf in San Francisco for $52.5 million. Four years later, they sold the hotel to Pebblebrook Hotel Trust for more than double the price they had paid. In 2013, CBRE bought the Marriott San Jose for $83 million. After a $10.5 million renovation, the company sold the assets for $154 million to Carey Watermark Investors in 2016. However, in 2011, FelCor acquired the Royalton in New York for $88.2 million, only to sell it for 33 percent less ($55 million) last year. During the underwriting process, investors analyze nearly every potential scenario to squeeze more upside from a hotel operation, be it through capital investment or improving operations. While all this impacts the cash flow to investors during the hold period, investors’ true goal is to increase the value of the asset to achieve a solid return upon refinancing or, more commonly, through disposition, or sale. In the vast majority of investments, value appreciation is where equity returns either hit their marks or fall short of expectations. Over the course of the current economic cycle, from 2009 until now, we have witnessed more than 100 institutional-quality hotel assets that have traded more than once. Numerous markets in the U.S. have seen double-digit value appreciation over this period, but as the examples above and those listed elsewhere in this article show, not all markets have done so well—sometimes unexpectedly. Local markets and the willingness of real estate investment trusts (REITs) to pay high prices for stable assets that provide current cash flow combined to drive value appreciation of hotel assets in some markets. However, it is becoming clear that opportunities that provide greater potential than management had originally anticipated are becoming increasingly rare, with implications for hotel asset owners and managers. By reviewing the trades of institutional-quality hotel assets that have been bought and sold more than once over the last decade, we can obtain an indicator of value appreciation for various markets.In our analysis, we used the acquisition price along with additional capital invested (typically for property improvement plan—PIP—requirements or repositioning) as the initial cost to investors, and compared this initial investment to the sale price at time of disposition. As shown in Table 1, the results are very telling for at least 15 major U.S. markets. Numerous U.S. markets have seen double-digit value appreciation over this period. 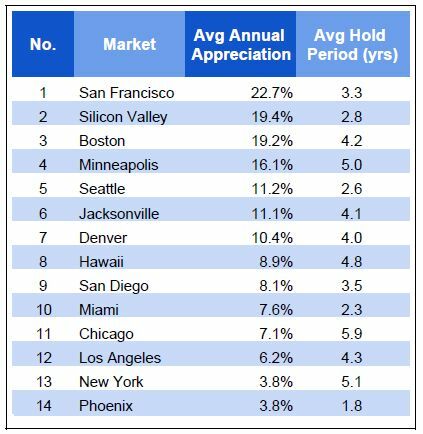 Many of these are not surprising, particularly the appreciation in San Francisco, Silicon Valley and Boston, which have been leaders in growth in revenue per available room (RevPAR) during the current economic cycle. Other hot markets like Minneapolis, Seattle and Denver have also experienced strong growth in property values. Jacksonville, which is not often on investors’ radar, ranks relatively high on the list, as well, showing an average annual appreciation of 11.1 percent. On the low end of the range sit two markets that have lagged in average rate growth during this cycle: New York and Phoenix. Prudential purchased the James in New York for $83.4 million in 2013, and then sold it for $66.3 million in late-2017. The Plaza in New York was valued at $575 million in a 2012 transaction. Six years later, it was set to sell for $600 million, illustrating an annual appreciation rate of only 0.8 percent. The James Chicago recently sold for $83 million, more than $53 million less than its acquisition price over a decade ago. The publicly financed Sheraton Phoenix is under contract to sell for $255 million, $95 million less than the cost to build it 10 years ago. New York is often a target market for investors despite its high cost of entry. The city boasts appealingly high occupancies and room rates, but the overall RevPAR growth for the market during this cycle has been disappointing. Nonetheless, although Manhattan is well below the appreciation level shown for several other major markets, a 3.8 percent average annual value appreciation can still equate to a safe investment return. After a five-year hold, a hotel in Manhattan purchased for $400,000 per room would sell for more than $480,000 per key. Even for an asset with stagnant net operating income, the unleveraged return could exceed 10.0 percent, as the example below illustrates for a typical 150-room property. On the other hand, notable hotel deals illustrate significant growth in market value. Several deals in San Francisco and Silicon Valley in particular illustrate the value impact of the robust technology sector coupled with minimal growth in supply. Thayer Lodging acquired the JW Marriott San Francisco in 2011 for $96 million, then flipped it to Chesapeake Lodging Trust in 2014 for $147.2 million. Similarly, Thayer Lodging acquired the Ritz–Carlton San Francisco for $161 million in 2013, spent $27 million revamping the product, and sold it to Carey Watermark Investors in 2016 for $272.2 million. Sunstone Hotel Investors acquired the Boston Park Plaza for $250 million in 2013, almost double the price the hotel sold for just two years prior. In 2011, KSL Capital acquired the Royal Palm in Miami Beach for $130 million and embarked on a $42.5 million upgrade to the James brand. They unloaded it to Chesapeake Lodging Trust for a handsome $278 million in 2015. The sales described above also demonstrate the willingness of real estate investment trusts (REITs) to pay high prices for stabilized assets that have current cash flow. With the current cycle now in its ninth year, finding such upside opportunities is becoming increasingly difficult. Acquiring assets at a discount is rare these days, as most sellers have growth baked into their pricing expectations. growth for net operating income over the next couple of years. Furthermore, as interest rates continue to rise, we expect very modest increases in asset pricing for the foreseeable future. Thus, most buyers do not anticipate riding a rising market to asset appreciation. Instead, they often are buying stable returns. Moreover, asking prices in some places are near or exceeding replacement cost, which is forcing many investors to shift their focus to development opportunities. assets rather than merely benefiting from the overall rising tide of the market. This places more of the burden for driving value appreciation on individual property managers and asset managers. negatively impact values at this point in the cycle. rather than looking to the local market to drive appreciation. Stephen R. Hennis, MAI, ISHC, CHA, has more than 20 years of experience in the analysis of lodging real estate investments. Over his career, he has appraised and evaluated more than 500 lodging facilities, and has been involved in the underwriting, negotiation, acquisition, and disposition of over $600 million in luxury hotels and resorts. Hennis oversaw the successful launch and expansion of STR’s consulting arm and developed several new products, including the Custom Forecast and DataCast reports. Previously, he was Managing Director of Hospitium, a lodging advisory firm specializing in acquisitions and developments of luxury properties. He also served as Vice President of Hospitality Investments for Lowe Enterprises and Destination Hotels & Resorts where he worked on acquisitions, dispositions, and development projects. Hennis managed transactions through the underwriting, negotiation, due diligence, and transition process. Hennis began his career at HVS where he was Vice President and Director of Research. A graduate of the University of Denver’s Fritz Knoebel School of Hospitality Management, and also sits on the Executive Advisory Board for the school, Hennis is a member of the International Society of Hospitality Consultants (ISHC), an MAI designated member of the Appraisal Institute and a Certified Hotel Administrator via the American Hotel & Lodging Association.